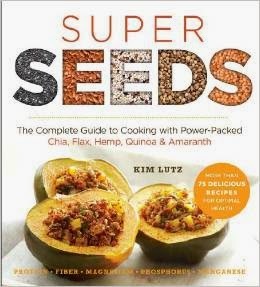 I am so excited for you all to see the beauty that is SUPER SEEDS! I can say that since I had nothing to do with the gorgeous photos or super-cute design. All of the recipes are vegan, almost all are either gluten-free or have a gluten-free option, and almost all have a nut-free and soy-free option, too. This week I whipped up a batch of the brownies from SUPER SEEDS. They use chia as the egg replacer, and I since I almost always have some on hand, it was easy to indulge our desire for a sweet treat. Seeing that container of brownies sitting on my counter gave me an irresistible urge to transform those chocolatey treats into an ice cream. With a container of light coconut milk in the pantry and my ice cream maker ready to go, we were enjoying this delicious ice cream for dessert in just a couple of hours! If you don't have an ice cream maker, you can freeze the mixture in a lidded container, and fluff with it a fork every half hour or so, until it's frozen. Since you don't have the SUPER SEEDS brownie recipe yet (though you can pre-order the book, so you're ready as soon as it ships), you can use the one from Welcoming Kitchen. 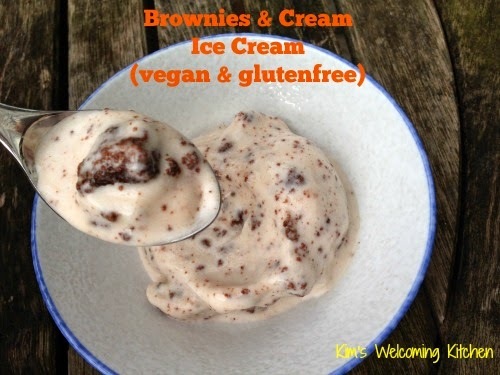 Vegan, gluten-free, allergy-safe brownie ice cream? Now that's something to scream about! Combine all ingredients except brownies in a small saucepan over medium heat. Stir over heat until sugar is completely dissolved (2 or 3 minutes). Prepare according to ice cream maker's directions. Add brownie chunks in last couple of minutes of freezing. Ice cream will have a soft-serve consistency straight from the machine. For firmer ice cream, chill in the freezer for another hour or two. This sounds great, Kim! I love brownie chunks in ice cream. :) Congrats on the new book--it looks GORGEOUS! Thanks, Ricki! I love to have some texture in my creamy ice cream. Your brownies would work so well here, too! Kim, that looks and sounds delicious, something even a vegan's non-vegan guests would enjoy! Congratulations on the book! Thanks, Jean! We devoured the ice cream.